Tipard DVD Creator, the professional Video to DVD Converter and Video to DVD Burner, is designed to help users create customized DVD folder or ISO files by putting several video clips together and directly burn DVD disc with fast writing speed. 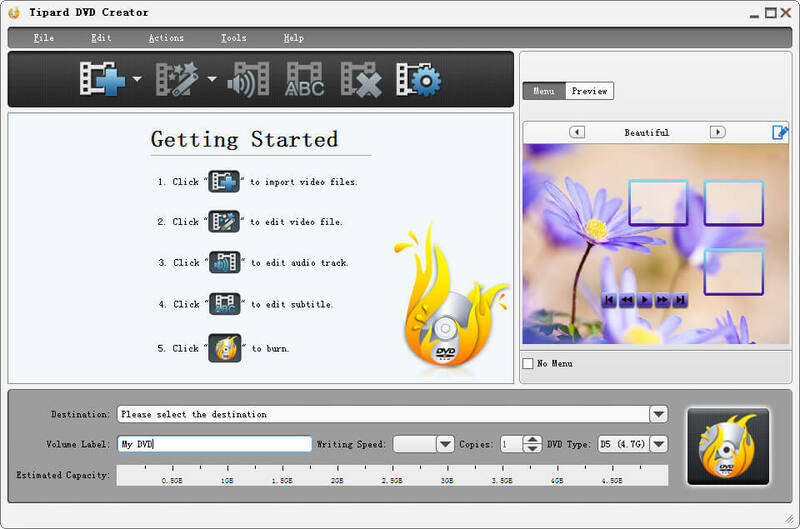 In addition, this DVD Creator gives you access to add desired audio tracks and subtitles to the defined video clip, or edit the audio tracks and subtitles to get ideal playing effect. Moreover, users can freely choose diverse menu background, frame style, button type and DVD title content, font, color and size to get customized DVD menu. In a word, once you own it, you can freely make personalized DVD disc or DVD file to keep beautiful memories in a longer time and more steady situation. Free download and try it by yourself. As the professional Video to DVD Converter and Video to DVD Burner, Tipard DVD Creator aims to help users to freely put several video clips together and create customized DVD folder or ISO files and directly burn DVD disc with fast writing speed. In addition, this DVD Creator gives you access to add desired audio tracks and subtitles to the defined video clip, or edit the audio tracks and subtitles to get ideal playing effect. As a powerful Video to DVD Converter and Video to DVD Burner, Tipard DVD Creator allows you to put multiple video files together to create a new DVD folder or DVD ISO file whose capacity less than 8.5G, which means you can create a DVD-5 or DVD-9 DVD file. You can directly burn a DVD to create a DVD-5 or DVD-9 DVD disc once you insert a blank DVD disc to DVD-ROM. Certainly, you should firstly set writing speed, Volume Label, copies and DVD type. Tipard DVD Creator gives you ability to freely add any picture and music you like from computer to the menu as the menu background picture and background music. Plus, there are various Frame and button styles to help you create customized DVD menu. Freely compose menu text contents, and set your perferred styles of font, color and size are also available for you with this DVD Creator software. This DVD Creator is highly compatible with DVD+-R/RW, DVD-RAM, DVD-5(4.5G) and DVD-9(8.5GB) discs. With a built-in player, when preview single video file, you are able to capture your favorite pictures and save it as JPEG, PNG or BMP formats. You can also set the saved folder or it will be saved automatically in the defaulted folder. Support converting multiple AVI files to DVD/VCD/SVCD/MPEG1/MPEG2 at the same instance in the fastest conversion speed (>400%), completely support dual core CPU. This DVD Creator provide Cool UI skin, and the powerful functions will help you to create your DVDs with ease. How to convert AVI/MPEG/MOV/DivX to DVD?